Geeks on Tour Blog: George Rules! It's good to have friends in high places! In this case, a 'high' place means lots of readers. As I mentioned in my last post, our path crossed the path of Tioga and George yesterday, and he mentioned us in his blog. Our blog normally gets 1-200 visits a day, yesterday after the mention in "The Adventures of Tioga and George", Google Analytics reported 878 visits! For all you new readers, make sure to take the Video Tour of the Blog OK? The link is at top of right sidebar. There's a lot more here than just this page. I haven't always believed that more readers is a good thing. Actually, it makes me a little nervous. I've always kept a personal journal, and even tho this journal is now public, I try to maintain a personal style. The more people who read it, the harder it is for me to stay 'personal.' But, I'm really excited about the 52 people who subscribed to our newsletter yesterday. The newsletter is the vehicle we have chosen to promote our income-producing activities. And, it's making income that will allow us to keep this wonderful lifestyle on the road. It's a verified opt-in newsletter. That means I can't just send it to you because I know your email address. You have to request it *and* confirm your subscription thru a follow-up email. You can learn more about the newsletter here - and subscribe, of course! THANK YOU GEORGE for telling your readers about us. We met up with George in Fort Bridger, Wyoming. George had found a quiet street and just pulled up to the curb and parked. We spotted Ms. Tioga easily when we pulled into town and just parked behind. She is sure looking spiffy with her new fiberglass and paint job don't ya think? See more pictures on our web album. 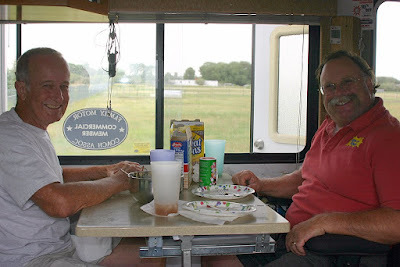 We first met up with George and Tioga at Devil's Tower in July, 2004. 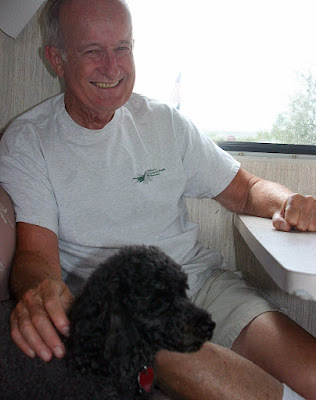 And, then again in Redmond, OR in August of 2004. So, it's been 3 years since we've seen him, but we didn't have to spend any time 'catching up' - that's what blogs are for! What we mostly talked about is what a thrill we still get just by looking around and realizing that we're at home wherever we are. Our RV lifestyle just gives us chills. Think about it! Here we are in Fort Bridger, Wyoming. A place we've never been. We pull onto a quiet street and park. Voila! We're neighbors. George comes over to our place for lunch. Then we all go over and visit George's home. We have a short video of touring thru Ms. Tioga. Go take a look! After a few hours of wonderful conversation, we get back on the road. 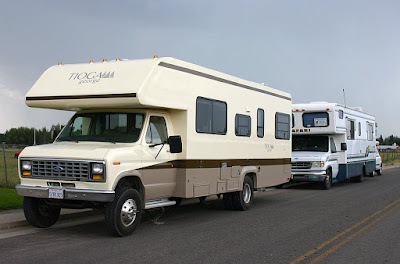 We will stay in an RV park and plug into electricity. George will move a few blocks to a more deserted parking spot and 'boondock'. That means living off the grid. He doesn't have to plug in because he has 6 solar panels on his roof that keep a bank of batteries charged up. We want to get solar and have the capability to boondock, but we do enjoy the comforts that 'plugging in' gives us. Like running the air conditioner all the time. That probably is due to our spending a lot of time in South Florida! We also envy that George has spent so much time in Mexico - we hope to meet up with him south of the border sometime! I found you through our common friend Tioga George. 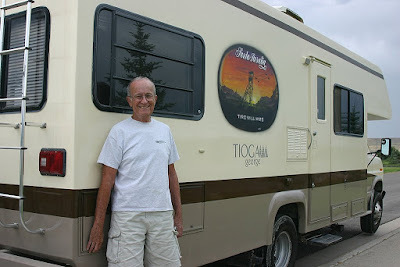 I have followed him for several years and now have you in my "RV Blog" favorite section as a result. It was great seeing (and hearing)George after all this time. Happy travels. I will subscribe to your newsletter as soon as I post this note. Nice to see you two "full timers" meet up again. I first found the address to your blog on George's blog some years ago. I've been following along with you both for a long time. I really enjoyed the new video of the inside of George's home. It's nice to hear all of your voices. You got to talk George in videos, they're really cool to watch. Someday I would like to be a full timer, as soon as my ship comes in. Thanks again for the tour video. Yikes. George is a good sport to let the dog...scratch that...to let your pet wander thru his house. I'd probably wanna made you flea...scratch that...wanna made you flee.